There’s been a lot of talk about trees recently at the Raleigh city council. This is because they are revamping their tree ordinance policies as it relates to what the utility company can to in terms of maintenance. Right now the Raleigh utility company can remove branches anywhere from two to eight feet away from power lines but this only applies to public property. 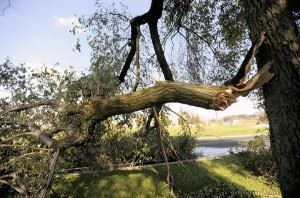 Private homeowners will have to take care of their own tree trimming. However, if the last round of super storms has proved anything it’s that trees and power lines don’t mix. This was the major reason for all those blackouts: falling tree limbs. You would be well advised to put aside your desire for lush foliage in favor of running power. When the utility company comes out to do a little tree trimming it’s free. They also clean up after themselves. If a tree has to come down all together they’ll grind down the stump and sweep up the sawdust. Clearing out debris like that is a good thing for the utility company to be a part of. What about the debris you have around your home? Maybe it’s not all fallen tree limbs but that doesn’t mean there isn’t plenty of junk you could get rid of. By doing that you’d be making your home more spacious and safer. Best of all, you don’t have to do it alone. Junk King of Raleigh is standing by to lend a hand. In fact, they’ll lending four hands when you hire them because every job comes with a two-man moving crew. They’ll also be sending along a truck with enough space to cart off whatever you’re throwing out be it a pool table or computer. When it comes to pricing, Junk King is extremely competitive. How much you’ll pay depends on how much space your junk will take up on that truck. There are no other fees like other companies charge such as dumping costs or travel time for the crew. That estimated price will be determined by a Junk King supervisor who will come out to your home for the assessment. Once they offer you that estimate and you agree it’s locked in. If it turns out that your junk takes up more room on the truck you won’t be charged a penny more. On the other hand, if it takes up less room you’ll be getting a refund. That’s a very fair way of doing this type of business. Call around to check out other so-called junk haulers. You’ll be coming back to Junk King Raleigh for sure! This entry was posted in Junk King Raleigh, Junk Removal Prices, Raleigh Junk Removal, Raleigh Yard Waste Removal and tagged Raleigh Junk Removal, Raleigh Junk Removal Prices, Raleigh Tree Disposal on February 19, 2013 by Britt Holcomb. Last updated August 1, 2017 .